Red Dog Jane as captured by Nevada City resident Stacy Grant before the apparition disappeared down the side of the hill. Nevada City, CA — Not long ago, if you talked with some of the Nevada County old timers invariably the topic of Red Dog Jane would come up. The circumstances behind Janie H. Barnes’ 1941 death are still a mystery. According to scant police records, Ms. Barnes was apparently walking alone towards Truckee during the early morning hours of September 6th, 1941 on what is now Highway 20. She was struck and killed by what the Sheriff assumes was another driver and died instantly. Her body was thrown from the road, down the hillside and was not discovered until over a week later by a prospector. 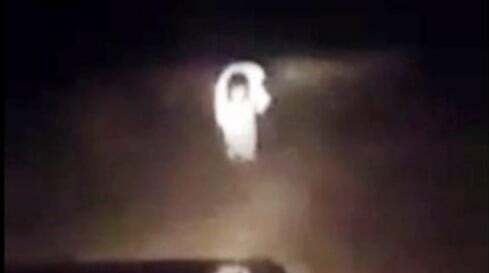 Ever since that night, during the month of September drivers have reported seeing a ghostly apparition hitchhiking towards Scotts Flat Lake. Most people believe this to be Red Dog Jane. It was then that Ms. Grant pulled into the turnout to see if the woman required help. Photograph of Red Dog Jane taken by Ritchie Bivin in September of 1957. The first known photograph of Red Dog Jane was taken by Richard “Ritchie” Bivin on the night of September 14th, 1957. Like Ms. Grant above, he was making his way alone when he spotted the ghost. Luckily he had an Agfa Super Isolette camera with him, which was a gift from his father who brought it back from the war. He managed to snap a photograph just before Jane disappeared. His photo, to this day, is the most terrifying version of Red Dog Jane. What’s remarkable about Ritchie’s photograph, is one can make out the face of Jane although she appears to be horribly crippled. According to Mr. Bivin’s son Ken, his father never spoke about the incident, and other family members were forbidden from mentioning is. If you have any information about Red Dog Jane, and/or have pictures of the apparition, Gish Gallop would like to hear from you. We’re offering a reward for verifiable pictures. Please contact us if you have any additional information.